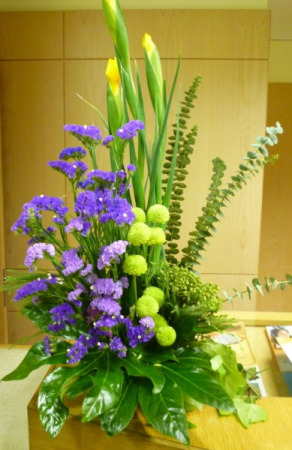 A contemporary mix of Garden Flowers of Iris, Scabiosa and Statice with tropical greens. 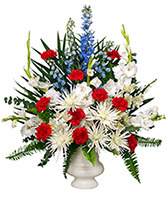 White Gladiolous, Blue Delphinium, White Fuji Chrysanthemums, White Alstromeria, Red Carnations, Silver Dollar Eucalyptus, Flat Fern, Leatherleaf, Premium Emerald in a White Urn. Price No. 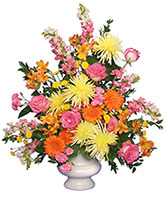 One is with Red Carnations Price No. Two is with One Dozen Red Roses.